Then I Got To Thinking...: Back To Work! I am back to work... and I must say, I feel so grateful to work with the great people I do. They were so welcoming and concerned with me coming back, and that means a lot! My dad was featured in a story today at my work! We've gone twice now since getting engaged, and it is just so fun and amazingly beautiful. Hope you are having a happy Wednesday! YAY! You're back and I am so so happy. what resort is it? i'm up there at least once a month, my best friends live in Napa and are having a baby, so i am there all the time. 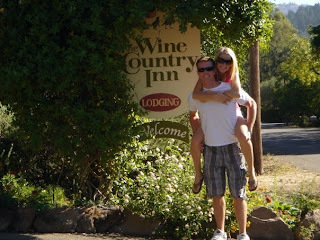 my friend's husband works at Solage Calistoga, Calistoga Ranch and Auberge so we get to stay at those places for cheap. it's amazing there, it's our favorite place to get away. I've been thinking about you, I'm so glad that you are feeling better! Yay your back and wine tasting? Glad you're feeling better and yay for Napa! I SO want to go to Napa, have a wonderful trip!! Yay for feeling better and you getting back to work! I've always wanted to do Napa! Have fun! have so much fun!! we had so much when last month when we went! so glad you're feeling better! I love Napa, we go there at least once a month!! Have fun! Glad you are feeling better and get to go back to work!! Have an amazing time in Napa and how wonderful about your dad's article. I love Napa, I hope BK takes me soon in the near future! How wonderful that you were able to get back to work!! I love Napa. Have so much fun. So much fun! I've always wanted to go to Napa! And I'm SO glad you're feeling better and back to work, girlie!!! !